How To Deal With Residential Water Damage? Water may be necessary for life, but it can also cause major damage to your home. Whether the invading water comes from heavy rains or a broken pipe, it can destroy your flooring and even wick up sheetrock walls to cause more damage. Items that never actually touched water can still absorb an incredible amount of moisture, and the damage will continue to build as the water sits. However, there are steps you can take to mitigate the damage and protect your home. The first priority is to stop the water from pouring in. If a tree falls on your roof during a storm, then you should call a roofing company to tarp the damage. Ice dams in the winter can lead to serious damage, but you can mitigate it by using pans in the attic to collect the water that is dripping in and calling for help from a roofing company. Stop broken pipes from leaking by turning off the main water supply. If the water is actively coming in through your foundation due to widespread flooding in the area, then you may have to wait until the storm passes. However, the sooner you stop the water from pouring in, the less damage you will have to deal with later. Proactive measures are vital to protect your belongings. When the water starts coming in, you should start moving items out of harm’s way. Small pieces of furniture can be moved into other areas of the house, and valuables should be secured in safe areas. You may not be able to move the large furniture, but you can still take steps to limit the damage. The faster you start cleaning up, the better off your property will be. You may have to wait until the water stops rising to avoid fighting a losing battle, but you don’t want to allow it to sit for days on end. If the water is more than a few inches deep, rent a sump pump to clear it from the house. Water that is soaked into carpets can be removed with steam cleaners, and dehumidifiers will work to get the moisture out of the air. Cleanup from a serious flood is not something you want to handle alone. A single person working one machine will not remove the water quickly, but a team of professionals can dry the carpet in record time. Using steam cleaners, dehumidifiers and fans, flood specialists can remove moisture and limit the damage to your home. 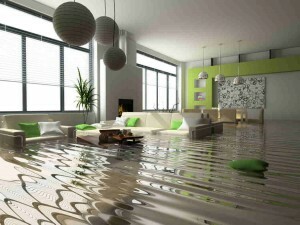 Residential water damage can be extensive if the water is not removed as quickly as possible. Trust the team at High Quality Carpet Cleaning to provide you with the services you need when water invades your home and threatens to ruin your belongings. Highly skilled professionals with years of experience, they can provide you with the help you require when you need it most. Visit them today at www.highqualitycarpet.com. If you need help or want to have more information, please do not hesitate to contact us.